Note: This is the second part of my exclusive interview with Evan Pantazi – The Pressure Point Picasso. Read part 1 here. J: Some people claim Kyusho is “BS”, and would never work in real life – against an attacker with adrenaline and aggression. They claim it only works in a safe dojo environment. What’s your take on the issue? Is Kyusho effective on the notorious “street”? EP: “Well this is not only in Kyusho. When people do not know or work with a paradigm or method, they tend to easily dismiss it – or worse, condemn it. Something else that throws people is the learning curve. Kyusho is not as easy as just trying to duplicate something seen on a video – although many to their credit have accomplished this. It takes time to develop the right power level, the right angle of attack, the right penetration to get to a nerve between muscles, bones and tendons, and of course, the proper weapon. However, in the dojo you are being cautious and not applying full intent. So yes, sometime it can fail. But in real need and under full intent, it is incredibly more powerful than the old YouTube videos show. I have heard hundreds of successes with Kyusho in real altercations, besides three of my own experiences. By far, the best testimonials I receive are from the Law Enforcement and Corrections Officers from around the world. They relate how fast, easy and safe Kyusho is on aggressive, drug or alcohol afflicted individuals they encounter – some on a daily basis. J: So, let’s keep it real: What’s ONE point every Karate-ka should know, and how can it be found/applied in Karate? My readers love practical stuff. EP: “All right, let’s take one of the most effective points there is: LI-18. This specific action can be seen at the beginning of kata Kusanku Dai/Kanku Dai, as well as other kata such as Useishi/Gojushiho. Most people that have seen Kyusho on YouTube have probably tried, and missed, this common point in the neck (LI-18). Often they may just have missed the target, or more likely hit it the wrong way, or with the wrong part of their hand. This point gets the best result when struck down with hard structure like the wrist bone, known as the “Iron Sword” in the Bubishi. Also, the strike must penetrate between the strands of muscles overlaying the nerve, since it works best if the nerve is stretched down like a guitar string; the tighter the string, the higher the vibration and frequency. Sensei Pantazi demonstrating the vital point LI-18, commonly found in many kata bunkai. By stopping the arm as you pull it down a bit, it causes the neck to turn slightly and stretches that area – making it weak and vulnerable. No complicated explanation. Just a good shot, with a good weapon, to a good target. In my Kyusho organization, we have studied this and its effects to both parties, and found many interesting and real physiological relations. As a matter of fact, we just did a 3D brainwave mapping that validated this. Now that I said that, let me also say that this is not combat effective as many in the seminar circuit portray. What is being paraded now is turning many people away from Kyusho, I believe, for the sake of ego. J: Fair enough. In my opinion, there’s no question that the energy an individual harbors can, and will, indirectly influence the collective subconsciousness of everybody around her. But knockout? I’d like to experience that myself! So, let’s bring it back to reality: You mentioned earlier that you’ve used Kyusho in self-defense. Can you share that experience? The pressure point (P-2), demonstrated by sensei Pantazi himself. J: Cool. So, except what we’ve already covered, what are some other common misassumptions you’ve encountered when it comes to Kyusho? EP: “First and foremost, the use of Traditional Chinese Medicine (TCM) to explain Kyusho – using the natural elements, cycles, stances, jargon and all of that to describe how Kyusho works. Kyusho is purely about causing stress and/or shock to the recipients physiological functionality (blood/nerve). We’re not even really using the points of acupuncture or acupressure. These are common misconceptions. 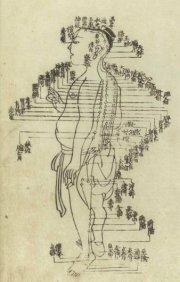 Ancient Chinese manuals of combat depict hundreds of structurally unique locations in the human anatomy. One of these manuals (‘Wu Bei Zhi’, a.k.a. ‘Bubishi’) even made it to Okinawa back in the days – where it inspired the first generation of Karate pioneers. J: Just like good Karate, good Kyusho is based on history and research. EP: “Exactly. For instance, let’s take a description from one set of historical papers, that states hitting the ‘Wakikage Point’ is fatal because: “Severe contusion to the lung and stimulation to the artery nerves. Causing stoppage of lung mechanism and breath and blood circulation”. That sounds like a Western medical description, far more realistic than the current TCM paradigm. J: Those are certainly some powerful observations, which sadly apply to Karate in many ways too. So let’s flip it around: Can you share your most profound and positive insight from your long career in the world of Kyusho? What “secret discovery” still keeps you going, after all these years of BS? J: Indeed! Lastly, what’s your best advice for Karate people who have no experience with Kyusho, but wish to start? J: And with those wise words we end this exclusive interview about the “lost art” of Kyusho-jutsu. Thank you very much, Pantazi sensei! I know my readers appreciate your knowledge, experience and generosity. Good luck with everything and keep keepin’ it real! Jesse Sensei,Thank you for the interesting article. I am on the fence as to this subject. I fully agree that striking anatomical weak points can create results, but hitting at the 'right' angle with the 'right' amount of force while twisting another body part seems like a complex task for combat. That said, I am very interested in the subject. Can you or your readers share any 'serious' books or research on the topic? I have not found anyone in my area that I trust to be qualified. Best regards, ~bob j.
Hi Bob I read your question but accidentally posted an answer on another comment. First, let me confirm that I have taught Clinical Anatomy to Doctoral canditates in the US and am currently in Okinawa learning Karate. There are few books worth reading on the human biology of martial arts, the best I found was one which has a fun title but is quite academic called "Becoming Batman" It was ok but there were many places in the book I disagree with. When it comes to Western medicine, most authors of injury books do not have the basic understanding of Human Biology. It is sad to say that even in academics in the US few have the proper training yet are teaching human biology at the lower division levels of Universities. These professors many times have about the same understanding of human injury as a fresh brown belt due to experience. I am currently looking for people with questions that want answers with peer reviewed articles from Medical and biological perspectives. If you want to see my style I have two articles on how I work on the published article section of Karatedr.com and would be happy to share some of what I have found. Dr. Gutierrez, Thank you for your response. I look forward to reading your book. It seems we were in Okinawa at the same time, I left the Sunday after Fitow slid by the island. I see you are from San Diego; perhaps we can meet someday as I am in the Los Angeles area and come to San Diego to train in Matayoshi Kobudo with Sanguinetti Sensei. Best Regards, ~bob j.
I look forward to meeting you, I am in LA quite often so hope to meet you there. and please just Raf, I only use Dr if I write a letter of reference. What was described above is certainly not physiology. Nerves do not transmit electricity. No electromagnetic energy is 'leached' out. There are no scientifically validated instruments to measure what was discussed.This is a misunderstanding of HOW the body works. Without opposition there is no success.Thank you Corey and Jeff as this is a perfect instructional opportunity that allows me to also use the interview Q & A information presented.Now anyone here can listen to me and accept, or listen to your viewpoint and accept that. Most will fall in between and that is why I suggested research for each and not just accepting or dismissing without investigation.Here is but one page of verification from the medical community: http://www.nwhandortho.com/nerve_injuriesJeff, thank you for the research.... Yes I received a 7th Dan from Dillman and turned down an 8th, shortly thereafter I was thrown out, but for something else.I trained under so many as I was never satisfied. Nick Cerio as example who studied next to Ed Parker under professor Chow (Kenpo). Tai Chi from Bo Sim Mak, Wally Jay... (Both listed in case I needed oriental credential), Even given an award from him for contributions. I was awarded Shihan back in the 1990s from George Mattson for my contributions to Uechi Ryu... And these are only a smattering over several decades. I also as stated have done many medical investigations with Doctors of several fields.I am open to further questions also as I know that research in brief sometimes only tells half the story.By the way I am down in Bermuda instructing a governmental agency for a few day, but the hotel has Internet. I may be able to chime in more than expected until I go to Germany from here.Apologies for the brief and fleeting answers to your questions and commentary. Hello Pantazi-san There are few books worth reading on the human biology of martial arts. I say this as someone who has taught clinical anatomy at the Dr. level and is interested in Karate. Most authors do not have the basic understanding of Human Biology. It is sad to say that even at the lower division levels of Universities few teaching human biology have even a brown belts understanding of injury and injury prevention. I am currently looking for people with questions that want answers with peer reviewed articles from Medical and biological perspectives. If you want to see my style I have two articles on how I work on the published article section of Karatedr.com and would be happy to share some of what I have found. Shankar, my site is: http://www.kyusho.com/ and just converted to a blog. There are recent articles on Nai Han Chi, seizing methods taken from old Kata as well as Iron Shirt, conceptual Bunkai, reverse engineering and much more (actually all) that can be related to Kata... And of course Kyusho.http://www.kyusho.com/totality/ relates to much of this interview as well. Thank you Mr.Pentazi, You see I have earlier mentioned about marmams the Indian version of kyusho and I have a hunch that it could be similar to kyusho-jutsu. I suggest that you visit India to learn more info or check it on the internet. Sorry, that should have been 'why dont' not 'why do'Thanks again. You are most welcome sir.PS I just saw this from the 3D brain mapping group we just visited this August to see how or what Kyusho operates in the brains communication as well as functionality: http://www.brainavatar.com/kyusho-demonstration.htmlPersonally I am not satisfied with myth, conjecture or BS, I am interested in the science as well as the art of humans. And my promise is to discuss all from experience, not theory.Keep those questions coming as we all will gain from them. Great interview! Thanks to Pantazi sensei for his insight into this fascinating art. It's so rare to see someone as knowledgeable as Mr. Pantazi be so open and patient to answering questions from other who in many cases know very little about the subject. I think we can all learn a lot from his example. OSU! Very interesting.I don't "understand" this stuff (yet), but I'm willing to be curious and investigate. This seems like something that is "right up our alley" as karate-ka ... using superior knowledge and skill to overcome a physically superior opponent.The criticisms levelled against kyusho seem rather reminiscent of the criticisms that brawlers level against kata, when they'd rather rely on overwhelming physical force. Ian,The difficulty for most people to accept it, lay in the explanation of what it is as well as the presentations of it.When you remove the false paradigm of chi and acupuncture science, to simply explain the actual anatomical structure and physiological functionality, people understand it to a deeper level. They learn it faster as well.I have been fighting this TCM Paradigm for many years; we first learned anatomy, then for the sake of more income switched... I was taken in as were most. But then while working with the doctors and scientists, I saw the simple truth.To your comparative of the Karateka and the Brawler, it too is similar; if you know your Kata inside and out, then you will watch an MMA fight and see each move comes from a Kata. The easiest to see (if you practice the Kata), is Nai Han Chi. Look at the grappling not as the motion, but the position of the body... you can see the Kata postures in virtually all positions. Once you can see this readily, then watch the same way to the stand up and more Kata becomes apparent. Kata is not a series of techniques (although it can be discussed and portrayed as such).. this is the confusion.It is the same with Kyusho,you hit a target and the person falls down which you can see. But most people do not know anatomy so they only see the surface or main action, they will not look at the deeper levels and will believe what ever is said to them. But once we get past surface and look deep many new discoveries will emerge. I have to say that I love the idea of Kyucho and hate pain compiance as I see pain as subjective. In clinics, you are asked how much something hurts but if something breaks the body, there is nothing of the "does this work?" someone who cannot stand based on a mechianical problem cannot stand. If we look at Kyucho as a purely Anatomical aspect it works. can you cause damage just by power alone but there is always someone stronger. If you mechanically destroy a structure, it is gone.